April Ryan, White House correspondent for the American Urban Radio Networks, captured video of the publicity-loving pooch who happily poked her head into the White House briefing room during a stroll. Sunny was born in Michigan in June 2012, and arrived at the White House August 19/2013. 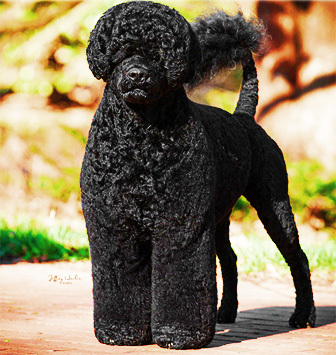 Just like Bo, she’s a Portuguese Water Dog, which works great for the Obamas because of allergies in their family. Sunny is the perfect little sister for Bo – full of energy and very affectionate – and the First Family picked her name because it fit her cheerful personality. An interesting footnote; the late senator Ted Kennedy and his wife Vicki gave the Obama’s their first portuguese waterdog Bo. The Kennedy’s had portuguese waterdogs named: Splash(deceased) and Sunny Listen to an excerpt of the late Senator Ted Kennedy read the children’s book he authored : My Senator and Me: A Dog’s Eye View of Washington, DC. and videos the the late Senator and his wife with their two portugeuese waterdogs; Sunny and Splashy. In the past, Bo has been eager to help the First Family with their official duties, from visiting Walter Reed and the Children’s National Medical Center , to inspecting the Holiday decorations at the White House, to greeting guests at the White House on tours and during the Easter Egg Roll , but in October, the First Lady told reporters that she hosted a “doggie play date” because “Bo doesn’t have enough dog interaction.” So now, in addition to helping with those official duties, Bo takes on the important role of big brother!